Organizational content sharing is a significant part of content marketing. Keeping your employees well-informed about internal matters and up-to-date in your industry will make them more knowledgeable and better at their job. Content - in general - is at the core of your communications strategy. Externally distributed content supports the positioning of your business. Therefore, the content you publish on your website, your blog or your social channels should be simple to understand and should provide value to your target audience. On the other hand, when we talk about sharing content internally, it has multiple functions. These include informing your employees about news in your organization, further educating them with industry-relevant studies and discussing topics that could be of interest to them. So, what’s the best way for doing that? We say, using an internal content hub! Have a look at our infographic about internal content hubs and remember to scroll all the way down to read the full article! 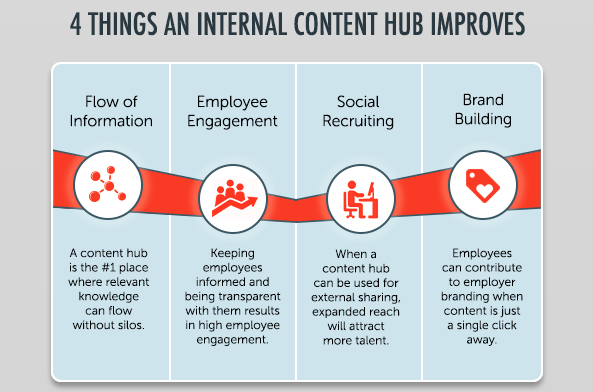 What Is an Internal Content Hub? An internal content hub is the best solution for making the flow of information as smooth as possible. It’s an easy-to-use online platform that serves as a safe place for storing content that informs, educates and inspires your employees. Information, knowledge, and sources of motivation can all be found in one place and they are available for your employees with a single click. The content in your internal content hub should be related to the industry your employees work in and to the job roles they have. The same content should also help your employees in succeeding in their daily work. In a hub like that, employees can comment on posts that they find interesting, and start professional discussions with their peers. No matter if you are a B2B or a B2C type of organization, content hubs work for you! Let’s take an example here. Tone Up! is a gym that has 500 employees. It keeps expanding internationally and it has plenty of member benefits which vary on a monthly basis, and which are different in different locations. The leaders of the gym would like to keep their employees (managers, receptionists, instructors, etc.) up-to-date on all matters. Let’s say they want to post quarterly group fitness timetables for the instructors, and they want to let all employees know when new talents are being hunted for the team. The leaders also want to introduce new products, services, equipment or class types to their staff, as well as recent research findings or scientific studies concerning life and fitness. They also want to share work productivity ideas, new coaching techniques, and effective customer relationship management methods, in order to raise interest and further develop their employees’ knowledge of the fitness industry. Now, instead of sending emails to their employees about every single matter, Tone Up!’s leaders rather use a content hub to upload all materials and announcements there. Each and every one of their 500 employees worldwide has an easy access to the hub. All they need to do is log in and scroll through the news feed. A good content hub has one general channel with information that applies to every staff member and has plenty of separate channels for individual topics and/or locations. These topics can be, for instance: -Personal Training, -Group Fitness, -Health Facts, -Customer Relationships, -Nutrition, -Anatomy, -Member Benefits, -Management Announcements, -Recruiting, etc. The sky's the limit! An internal content hub can easily be turned into an external content sharing hub, as well. Simply by adding the functionality to attach social media profiles, the content that has been uploaded to the hub’s news feed can be shared on employees’ social media accounts. Obviously, internal-only-content needs to be set for “Internal Reading Only” mode, so that the hub doesn’t allow anyone to accidentally spit out confidential information to the world-wide-web. However, gym promotions, scientific studies or life hacks can be (and should be) shared externally as well as internally! By doing this, employees are able to build their own reputations as fitness industry professionals, and at the same time, they are advocating for Tone Up! - the company they work for. When we think about these for a moment, in fact, half of these issues can be solved, or at least lessened, with an internal content hub that’s actively used. It’s easy to create a culture of collaboration and innovation when an internal content hub is in use in your organization. It enhances peer-to-peer, leader-to-peer and peer-to-leader types of communication, and at the same time minimizes the number of silos within the organization. In addition to that, employees will feel valued when they are able to communicate directly with higher management regarding professional content. It’s also possible to use this hub as part of a learning and development strategy where leaders can reach their staff with creative content that has a developmental function. Examples of that could be short 5-minutes videos, infographics from your business sphere or PDF-formed research or scientific documents to support business success. This type of industry and business-specific educational content will make sure your employees aren't missing out on industry-related trends. Many organizations struggle with not having enough information about what other departments do within the same company. An internal content hub can be the solution for informing all departments what each and every team is working on. This way, the fog disappears and teams can have a clear image of what other departments are dealing with. One big organizational challenge is employee engagement, which has a direct link to work productivity as well. The more you are able to motivate your employees, the more engaged they will be, and the better their work results will be as well. When you ensure your content hub has a gamification feature, you are able to leverage your content hub as a resource for employee motivation. With gamification tools, you can reward employees when a content is shared externally, or when a discussion has been started in the comment section of the content. A platform like Smarp is made for that. 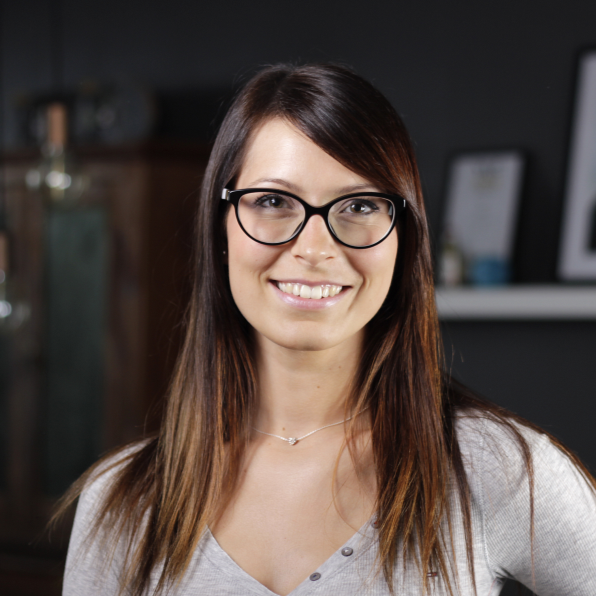 Companies should use internal content hubs for sharing knowledge with their employees. As it was mentioned at the beginning of the article: an internal content hub exists to inform, educate and inspire everyone in the organization. Knowledge sharing is the key to employee engagement. Keeping employees informed and being transparent with them about organizational matters through a content hub will make them more attached to their jobs and more motivated about their work. Aim for a good content hub that has the functionality to be used externally, as well! In that way, employees are able to share open positions with their own social circles, so that more and better talents are likely to apply. When promotional content is a single click away from employees, they are more likely to advocate on social media about the organization they work for. That way, they are strongly contributing to employer branding.